Each year, I approach my 4th grade non-fiction research unit with equal parts excitement and dread. I am excited because along with my students, I always learn something new about an American business founder. I dread the unit because it involves a research paper, and it takes all of my teacher super powers not to jam a child into his locker when he looks up at me and says, “I’ve read EVERYTHING and there is no information about Henry Ford.” Fortunately, I also teach common prefixes, so I can calmly remind the student that REsearch means search again. Coaching these kids through their first research essay is a good thing, and they acquire so many skills because of it. As much as the process pains me, I repeat it every year. I have used this research system with 4th grade, 6th grade, and 9th grade. It works for every age on any topic in almost every subject area. Before letting kids loose on the Internet to find facts, focus on some sub-topics. In my classroom, students write 3-5 open ended questions they will try to answer. Parents, if you are working with a child at home, brainstorm some sub-topics to give the research a direction. Use the 3-5 questions or sub-topics for research. Now, every time a student opens an article, he will be trying to answer one of his questions. Rather than writing random facts, students are actively searching for information that is related to a specific idea about the main topic. In addition, the questions provide key words to help narrow Internet searches and make the research more efficient. The idea is that a student tries to answer all of his questions with one source. Then, the child tries to answer the same questions with a new source. Repeat with a third source. If the child is getting the same information in all 3 sources, it is reliable information. If a student can’t answer any question, he moves on to a fourth source… or a fifth. I have been known to repeat the fact that websites and reference books will not have big red arrows and highlighted words pointing to the exact information someone might need. A student might have to summarize, interpret, and infer reading material. The information will not be provided in the same tidy way as a textbook. Create a way for students to contain all of their information, so it does not get lost traveling from school to the locker to home. 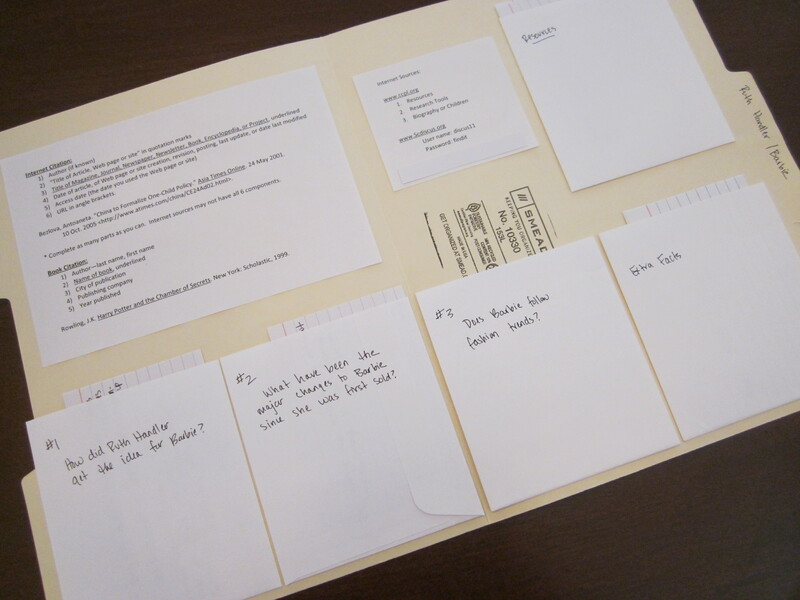 Give students a manila folder with pockets to hold notecards. Seal business envelopes, cut them in half with a paper cutter, and glue them to the envelope. I also print a short list of Internet reference links and sample bibliography formats, which we glue to the folder as well. 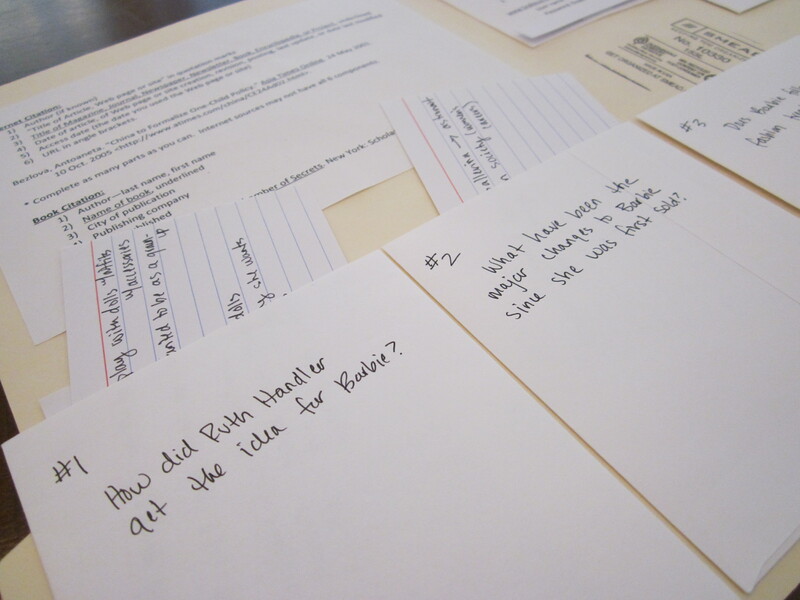 Students write each question or sub-topic on one pocket. 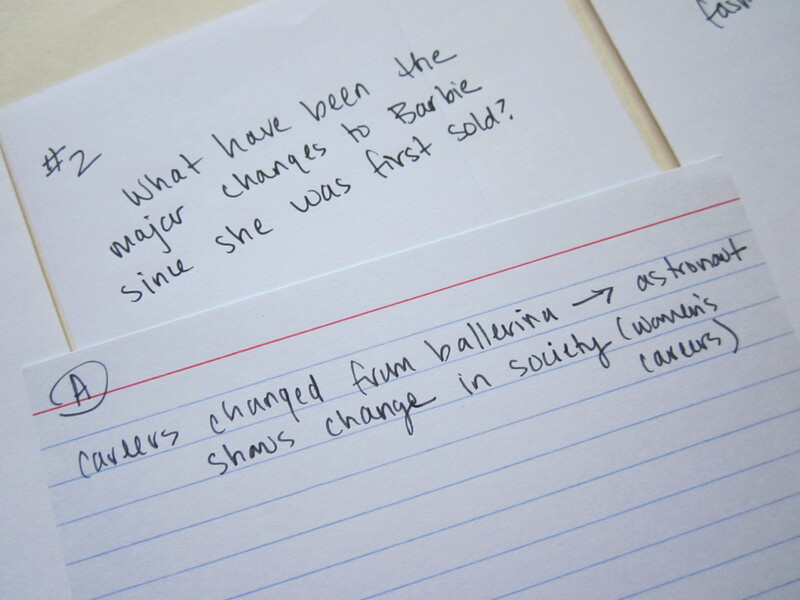 Any time a student finds a fact related to one question, they write the note on the notecard and store it in the appropriate envelope. Now all related notes are grouped together in a handy carry case. This is very difficult for my students since it is their first serious attempt at a bibliography. 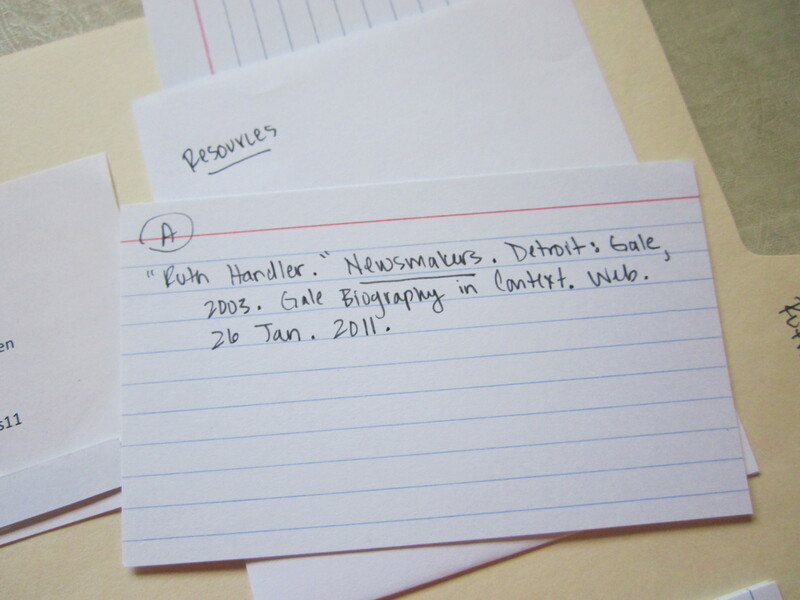 Having the pre-printed bibliography page with samples pasted to the manila folder helps. As students take notes, they must record the source at the same time. Do not put a source away (or click it closed) without writing the information needed for a bibliography. Code all notecards from one source with some sort of symbol or letter. All “A” cards would relate to one source. Or, all cards with a star would relate to one source. I have to model note taking for my students, and we practice before the project starts. You may not have to go through this step, but it is still a good idea to give some reminders about note taking. I have a few rules I ask the kids to follow. Never write more than one line at a time. This reduces plagiarism since students can’t copy large chunks of text. They must summarize and re-word to fit information into one line at a time. 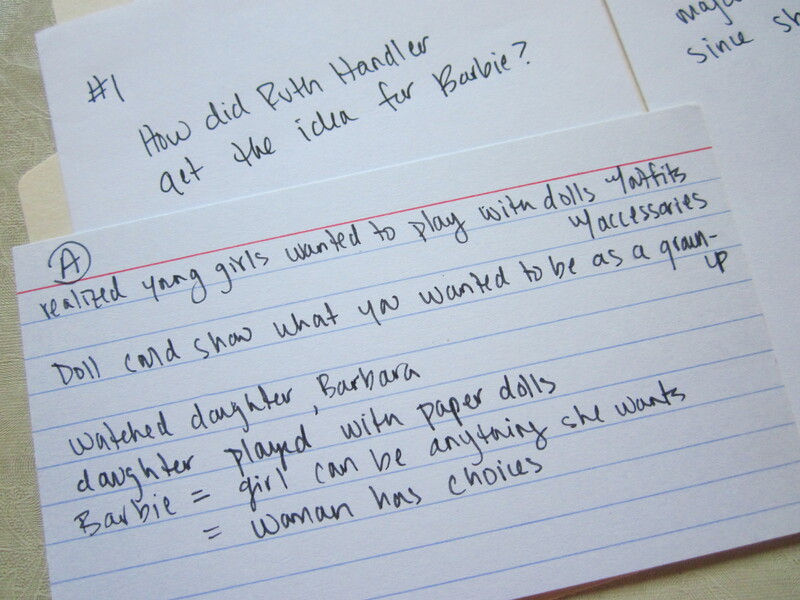 Never write a word on a notecard you do not understand. Look up the unfamiliar word, write a synonym, or explain the word. Avoid Wikipedia if at all possible. Anyone can post information on Wikipedia, so it is not always reliable. Kids like to go there first and then quit. I tell my students that Wikipedia is off limits (audible groans detected immediately). If students have sufficient notes, the paper is easy to organize. If students are taking notes related to the questions or sub-topics, notes will be organized and ready to be translated into paragraphs as part of an essay. The organization happens while researching rather than having to sort notecards later and hope that central ideas emerge from the pile of notes. 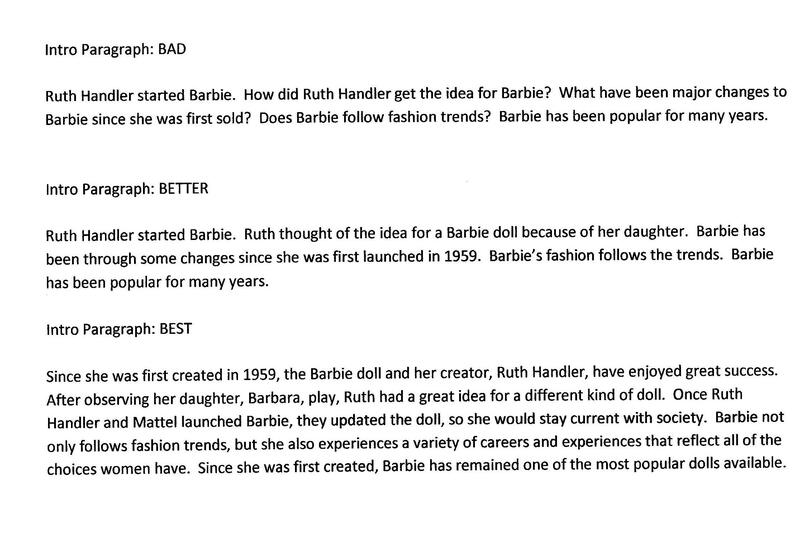 Create an introductory paragraph using the open ended questions or subtopics. Those ideas become the body sentences for the first paragraph. Notes from the first pocket will create the 2nd paragraph that follows the intro and so on. If any extra fun facts are collected, incorporate those into the first or last paragraph. This is a good time to practice or introduce Transition Words. My system is by no means foolproof, but it is more efficient than the way I learned to prepare a research paper. Please let me know what works well for you (parents and teachers). Commercial Break: To see more of my non-fiction and research ideas for teachers on TpT, CLICK HERE. I like the way this is organized. It works for any type of project or research – school or work. I agree. It could be adapted for a whole bunch of projects and ages! Thanks for reading. I will certainly try the pocket approach for our next project. We have found easybib.com to be a great bibliographical tool for all ages. It also allows for creating an annotated bibliography. Thanks for the tip. I don’t know that site. My 4th graders write research papers after the holidays, and everyone attempts a bibliography. We all might be using Easybib this year! I’m going to use this idea in a homeschool class I’m teaching this fall. Hoping to revamp my blog and include a business side for my classes and editing services, so I’ll be sure to link back to you when I talk about this method. Thanks for sharing! Any ideas for using this organizational approach for teaching argumentative writing? I think students could think of the 2-3 points they want to make to defend their position. Each point would go on the front of one of the envelopes. Then, they could locate facts that would support their point. The ideas that match the point would go in the related pocket. It would help them focus arguments and provide specific back up for each point. This would probably work for debate prep too! My hat’s off to you. 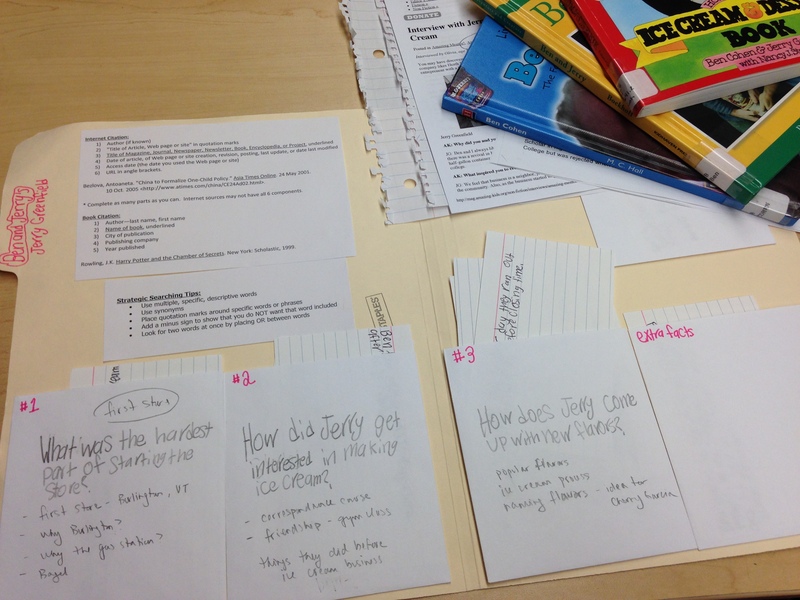 One year, I wanted to teach 4th graders library and research skills. This was inspired at least in part by something that happened in my domain. Some 5th graders volunteered to help out at recess. Since I had a number of books that needed reshelving, I asked them to organize the fiction alphabetically by the author’s last name. The kids were more or less clueless. When the teacher scheduled a session, the most readily available lesson was the Dewey Decimal System (which is alive and well in countless libraries worldwide). It was successful but, as the school year was drawing to a close and the students were sadly so bogged down with standardized testing, there was no time for an alphabetization lesson. With projects like yours, kids are learning valuable research tools. Thank you for liking my post.